Building low-maintenance decks and porches in Lee’s Summit MO since 2001. 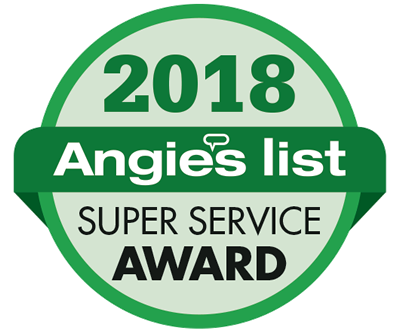 Archadeck of Kansas City has been providing custom decks and porches in Lee’s Summit and the Kansas City area for more than 18 years, including low-maintenance decks, covered porches, and screened porches. As your long-standing outdoor living builder in the area, we can help you design and build the perfect space for your home, family, and lifestyle. Whether you are looking for an open-air deck for full sun or starlit enjoyment, an open porch with sun protection, or a deck or porch complete with outdoor fireplace for more extensive yearly use, Archadeck of Kansas City wants to help you plan a custom space that best suits your needs for entertaining and private relaxation outside your home. If you are considering a custom deck for your Lee’s Summit home, Archadeck of Kansas City should be your first choice for several reasons. 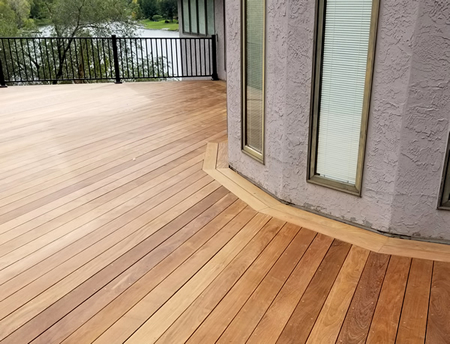 One option many local homeowners are choosing is low-maintenance synthetic decking by AZEK, to provide a fun and relaxing outdoor living space that does not require yearly sanding, staining, sealing, or painting. AZEK decks maintain their appearance even after many years of use and environmental exposure. Decks have many uses and can be customized to accommodate your favorite outdoor activities, including grilling, eating, relaxing, or visiting with family and friends. An expansive custom deck, like the one above in the Lakewood neighborhood of Lee’s Summit MO, can be staged to accommodate distinct areas of outdoor living, such as relaxing, grilling, and eating all on the same space. As seen in the photo below of this Sterling Hills neighborhood Lee’s Summit deck, Archadeck of Kansas City can provide custom touches and designer elements that will create a space that is all your own. 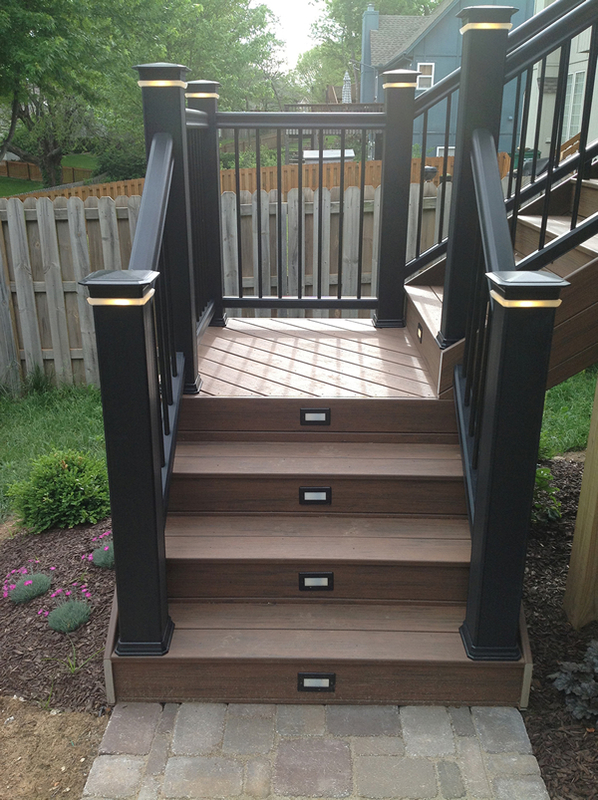 This low-maintenance deck includes lighted post caps and stairs for traversing the space after dark, and a diagonal deck boards installation to create a custom aesthetic. 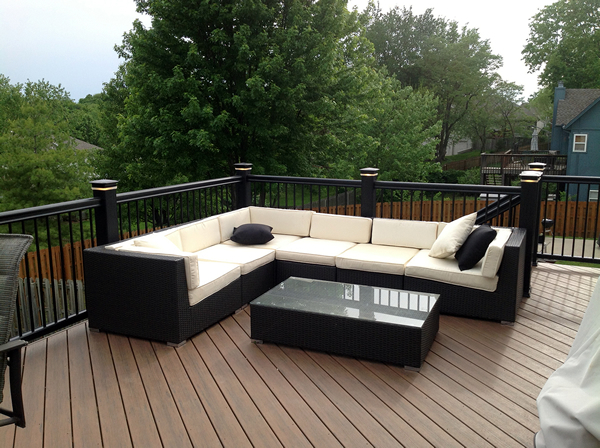 Diagonally installed decking adds interest to this low-maintenance Lee’s Summit deck design. 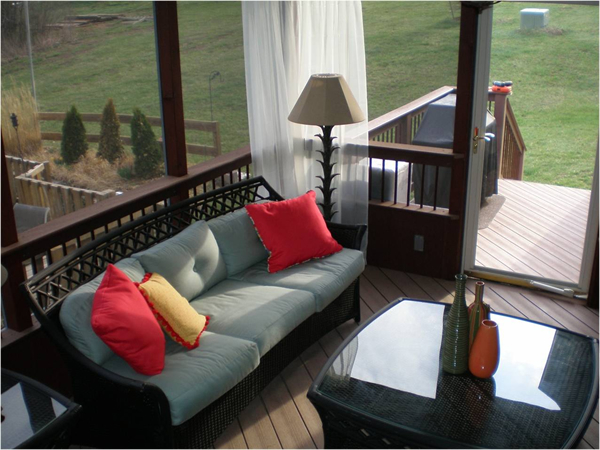 Custom touches are the hallmark of an Archadeck of Kansas City low-maintenance deck design! Lighted deck stairs will allow this family and their guests to safely travel the stairs in dark hours. The turned stair will bring them safely to a level landing pad, rather than onto the sloping lot. Adding a custom fire feature to your Lee’s Summit deck will give you even more enjoyment throughout the year! 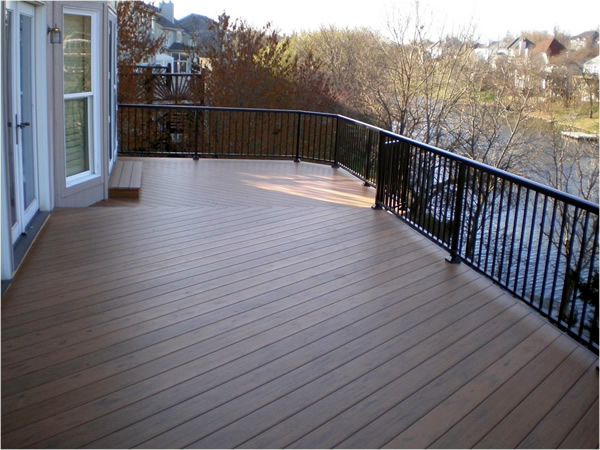 Archadeck of Kansas City can recommend custom options that will extend the time you spend on your deck each year. By simply adding a pergola, where partial sunshade is provided, you will be afforded extended use on full-sun days that might otherwise be spent indoors. Adding a custom fireplace will provide even more time and enjoyment on your deck. Fireplaces integrated into your deck provide comfort and ambiance and are beautiful focal points to boot. This custom low-maintenance deck, pergola, and outdoor fireplace combination create the perfect setting for gathering with family and friends, or spending time in quiet contemplation. The custom pergola not only offers partial sun protection, but also works in correlation with the stone fireplace to create a rustic chic focal point. This warm and inviting space will provide many hours of enjoyment throughout the year for these Lee’s Summit homeowners. Custom Lee’s Summit MO screened porch with low-maintenance decking and attached grill deck. 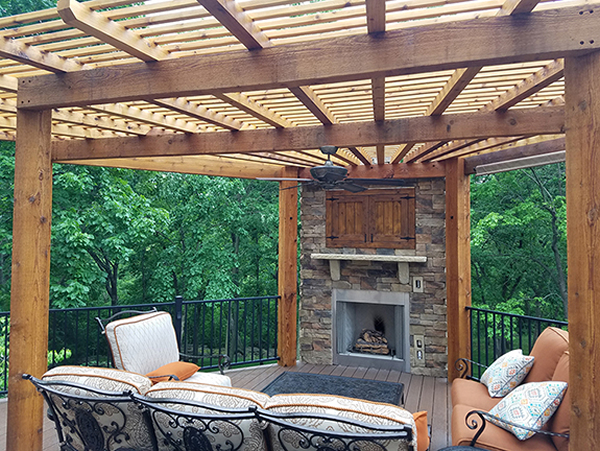 The cozy screened porch above in Lee’s Summit is an example of how Archadeck of Kansas City can provide simple solutions for multiple outdoor living options in one space. This screened porch is a great spot for entertaining and relaxing inside and it provides direct access to a low-maintenance grill deck just outside the screen door. We can offer custom solutions to accommodate your outdoor living needs. You are not cornered into choosing only one use for your outdoor space – your choices are only limited by your imagination – we can help you tap into your ideal outdoor living scenario. The photo above is a custom elevated, low-maintenance AZEK deck and pergola with corner stone fireplace in Winterset Woods neighborhood of Lee’s Summit MO. Meticulous attention to detail was taken to cohesively blend the design of the new outdoor living space with the existing home. The muted earth tones of the stone are a perfect match with the home’s exterior finish, while the warmth of the cedar posts and pergola harmonize in contrast. A black low-profile picket railing surrounds the living space, but does not impede the view beyond. 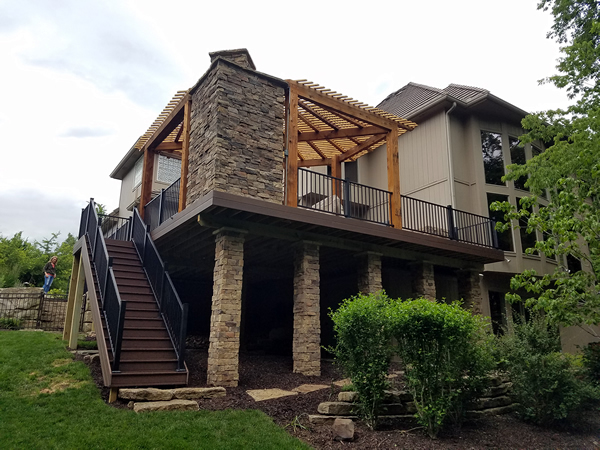 Custom design touches, such as stone-wrapped support columns under the deck and finished fascia are consistent with the authenticity of every Archadeck of Kansas City outdoor living project. 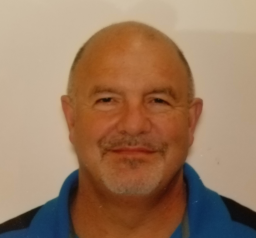 Archadeck of Kansas City wants to be your preferred porch builder in Lee’s Summit and surrounding Missouri cities of Blue Springs, Gladstone, Lake Lotawana, Raytown, Sugar Creek, and Independence. Covered porches will offer protection from inclement weather and full sun on hot summer days. Lee’s Summit residents are choosing more and more to build custom porches onto their homes and adding fireplaces to extend their time outdoors each year. The warm and inviting open porch above in Lee’s Summit provides a comfortable outdoor living area under a custom gable roof. The high roof will allow for light to enter the covered area while direct sunlight is kept at bay. 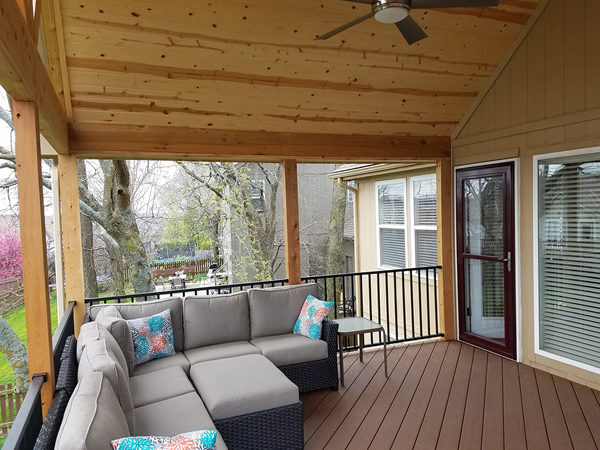 Custom touches, like the tongue and groove ceiling, ceiling fan, and diagonally installed AZEK decking are hallmarks of the types of customization that Archadeck of Kansas City can provide for your outdoor living space. This elevated porch was built directly off the home’s main living area, where it will get more use than if it were placed on the ground level. This expansive Lee’s Summit deck was built with Ipe Brazilian hardwood. This beautiful hardwood rivals the benefits of low-maintenance materials in that it is very durable and fire retardant. These Lee’s Summit homeowners can choose to periodically stain and seal their richly-colored Ipe deck to maintain its finish, or allow it to naturally gray over time. Notice the custom details in “picture framing” around the home’s architectural details and the perimeter of the deck. Ipe exotic hardwood is a choice material for many homeowners for its beauty and durability.